So it’s meant to be a lighthearted book about cosmology and particle physics – two notoriously heavy subjects – aimed at the general reader, with an emphasis on the fun of doing science. That sounds like a great book concept, and De Rújula certainly makes an effort to live up to it. His jaunty writing style is entertaining and sometimes genuinely funny, spanning all the usual suspects from quarks and Higgs bosons to gravitational waves and dark matter. The book is profusely illustrated with quirky full-colour cartoons, mostly drawn by the author himself. In style, they appear to be aimed at 11 or 12 year olds, which is presumably why he only excluded ‘very’ young kids in the above quotation. Unfortunately, most 11 or 12 year olds (or even 40 year olds with no grounding in mathematical science) are going to find the book hard going. The fact is that De Rújula – a theoretical physicist at CERN for the last 40 years – is simply too close to the subject. In common with many professional scientists who try their hand at writing, he confuses ‘general reader’ with ‘first-year undergraduate’. He understands that many readers won’t like equations (chapters that contain them are marked with asterisks so they can be skipped over), but he doesn’t realise that the problem goes further than that. Even his non-asterisked chapters are filled with logarithmically scaled graphs, powers-of-ten notation and variables with Greek names – and all those things are going to scream ‘mathematics’ to most people. Every now and then he falls into the trap of trying to educate – rather than simply intrigue – the reader, and then the ‘physics is fun’ illusion collapses completely. I’m not really a ‘general reader’ myself, since I’ve got a degree in physics, but some of the asterisked chapters (such as the one on Renormalisable Relativistic Quantum Field Theories) still managed to go over my head. 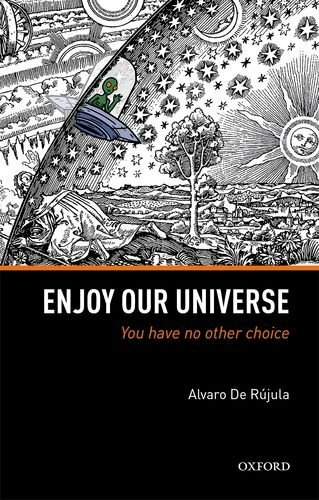 At some points I wondered if De Rújula actually started out to write a different book altogether – an amusing take on physics to be enjoyed by physicists themselves – but was persuaded by the publishers that it would sell more copies if ‘physicists’ was crossed out and replaced with ‘general audience’. Certainly some of the book’s anecdotes and in-jokes will make a lot more sense to people who already know something about the subject – as will some of De Rújula’s more offbeat opinions (such as his argument than Einstein misunderstood E = mc2). Here’s another example. One of the book’s cartoons depicts the ‘Margaret Thatcher at a cocktail party’ analogy for the Higgs boson. This may be familiar to a few of the book’s readers – but probably not the younger ones, or those living outside the United Kingdom, who may not even know who Mrs Thatcher was. Yet the analogy isn’t spelled out in the text, and the caption tantalisingly says ‘It would be difficult to misrepresent better the underlying physics. There is no sense in which inhabitants of the vacuum gather around a massive particle’ – with no further explanation than that. What a missed ‘physics is fun’ opportunity! It needs at least a page of text to explain the political background to the competition that produced the analogy, the logic of the analogy itself, and why De Rújula thinks it’s a bad one. The book’s back cover boasts glowing endorsements from not one but two past winners of the Nobel Prize for Physics. That’s cheating, really, because he said earlier that it wasn’t a book for physicists! Personally I’m not sure who it’s for – and that’s my main criticism of it. If you’re thinking of buying it, I’d recommend reading a few sample pages first. If you enjoy them, you’ll probably enjoy the whole book. If you find them too quirky or confusing, then it’s best to give it a miss.